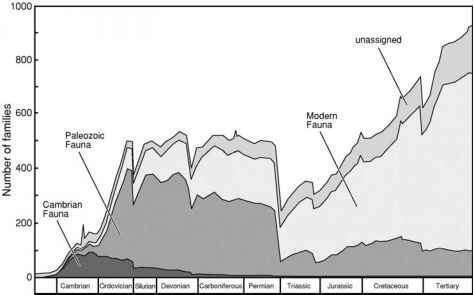 The 1970s and 1980s witnessed a veritable boom of publications which documented the diversity patterns of life during earth history, the pace of large-scale evolution. Yet the achievements of the late "Jack" Sepkoski clearly stand above those of all others at that time. His 1981 curve (O Figure 16.2) of Phanerozoic diversity patterns of marine families (and subsequent refinements down to the genus level; Sepkoski 1996) is one of the most often reproduced figures in the paleontological literature (equaling perhaps the Berlin Archaeopteryx specimen; Benton 2001), and this benchmark is an ideal starting point for the discussion of life's ups and downs during the last 542 Myr. times of origination (first occurrence) and extinction (last occurrence) of these taxa could be deduced. By means of a factorial analysis, Sepkoski (1981) could show that the marine families grouped into three rather well-delineated entities each showing a common pattern of origination, diversification, and decline. These three "Evolutionary Faunas'' were called "Cambrian Fauna,'' "Paleozoic Fauna,'' and "Modern Fauna'' (Sepkoski 1981). A division into finer intervals (nine "Ecological Evolutionary Units'') was suggested by Boucot (1983) and further refined by Sheehan (1996, 2001a); yet these intervals mainly portray ecological communities and not evolutionary units. Diversity at the family level shows a sharp rise at the beginning of the Cambrian, which continues well into the Middle Cambrian. In the Middle Cambrian, a plateau was reached and several drops in diversity occurred. The main representatives of this Cambrian fauna were trilobites, inarticulate brachiopods, hyolithids, monoplacophorans, archaeocyathids, and eocrinoids (Sepkoski 1981, 1984). During the Early Ordovician, diversity increased again to reach a level about three times that of the Cambrian. Responsible for that fast and unprecedented increase in diversity were members of the Paleozoic fauna, mainly articulate brachiopods, crinoids, rugose and tabulate corals, ostracods, cephalopods, bryozoans, asteroids, ophiuroids, and graptolites. The diversity reached by the Ordovician radiation remained almost constant through the rest of the Paleozoic, interrupted only by punctuations of extinctions and subsequent recoveries. The Late Permian witnessed a dramatic extinction pulse, and the members of the Paleozoic Fauna lost their dominance. The Modern fauna (demosponges, bivalves, gastropods, gymnolaemate bryozoans, and malacostracan crustaceans) had its origins in the Paleozoic but its members remained a minor component up to the Permian. 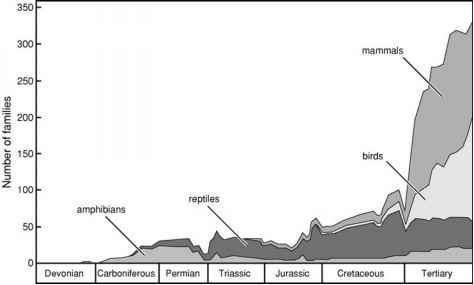 During the Triassic, Jurassic, and Cretaceous, members of the Modern fauna originated at a considerably faster rate than members of the Paleozoic fauna, and overall diversity increased steadily throughout the Mesozoic. The End-Cretaceous extinction appears at the family level only as a minor perturbation, and the diversity increase continues throughout the Cenozoic. By the end of the Neogene, family diversity had reached a level almost twice that of the Paleozoic. The taxic diversity trends observed by Sepkoski were accompanied by several notable trends which relate to the structuring of the marine communities. During the Phanerozoic, the species numbers within open marine assemblages increased through time (denser "species packing''; Bambach 1977), and between the three evolutionary faunas, a significant increase in the number of feeding types and occupied substrate niches ("guilds") is documented (Bambach 1983). In addition, the proportion of mobile taxa and of predators increased (Bambach et al. 2002). This is paralleled by changes in the spatial structure of marine benthic communities. Animals of Cambrian communities neither extended high above nor burrowed deep into the substrate, but during the mid-Paleozoic to mid-Mesozoic, many suspension feeders evolved that stood highly erect above the substrate and several tiers of epifaunal benthos developed (Ausich and Bottjer 1982; Bottjer and Ausich 1986; Signor 1990). A complex tiering as documented by the trace fossils also developed among the burrowing endobenthos although very deep burrows only became common in the latest Paleozoic. 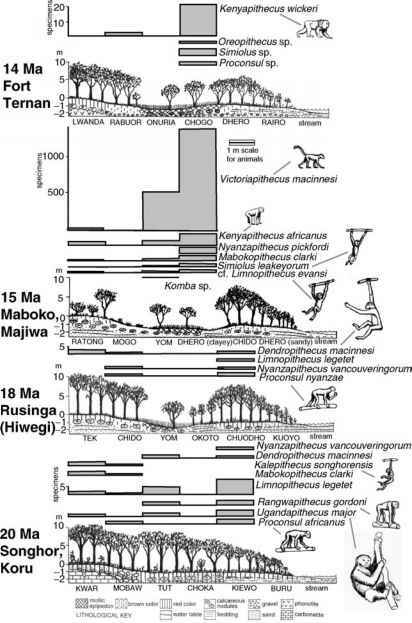 from the various animal groups in that the family richness over the Phanerozoic follows a much smoother path, and extinctions had little effect on familial diversity (Niklas 1997).